We are located in the heart of Nizhny Novgorod, a city with 800 years of history. We are surrounded by historical landmarks and beautiful views and landscapes. A bright, clean and very spacious dorm with sturdy bunk beds for Spartan, but comfortable rest for 8 people. Every guest gets his own locker, an electrical outlet and a lamp. Simple design in man's colors for seasoned travelers. A spacious and cozy dorm for 8 females with bunk beds and 2 shower stalls in the bathroom. There is an electrical outlet and a lamp next to each bed. Every guest has her own personal locker with a key. Simple and fun interior in the Old School style. A bright and beautiful room. With a big wrought iron bed, a distressed wardrobe, TV, this is a room out of a dollhouse that you will have hard time leaving! 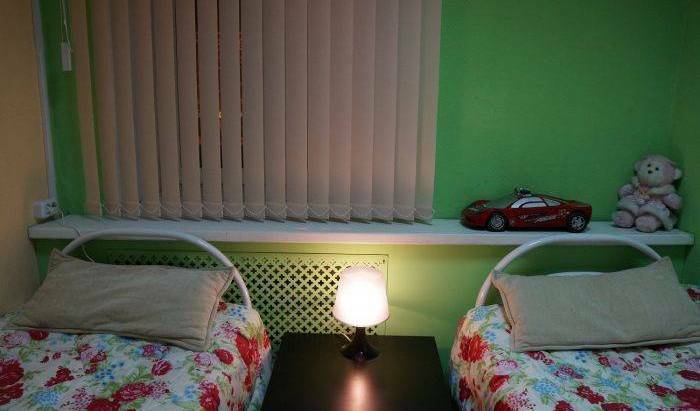 A lovely spacious room with two single beds, a wardrobe, a coffee table and a nightlight. Gold-leaf wallpaper and floral curtains add Provence style charm to the room décor. You will rest comfortably in this charming and cozy room. Simple, yet elegant design is complete with a big sturdy bed for two, 2 beds for one, a wardrobe and a coffee table.